Description:- How many times have you painted your child’s face only to despair when it came to washing off the product? So often I have had to scrub delicate faces; usually failing to remove all the colour needed to create a tiger or princess! LYRA could be our answer. LYRA skin paints are a quality cosmetic product, manufactured according to – Good Manufacturing Practice – which governs the production of food, pharmaceutical and cosmetic products. All paints are dermatologically tested and non-toxic, and are easily washed off of faces and clothes with water. LYRA paints contain organically certified Beeswax and can be used on the face and body. 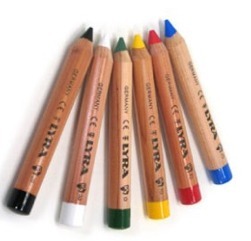 Lyra Face painting pencils offer intense colour, due to extensive compression of the lead, leading to longer wearing. The wood casing on the pencils helps keep fingers clean when applying. LYRA does not test its products on animals and the manufacturing process is environmentally aware. 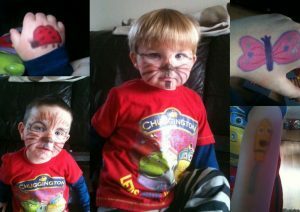 Review:- I LOVE these facepaints, they truly are the best I have ever used and being the type of person who loves to draw and dress up I have used a few. The fact their are pencils means no mess, no mess on your hands and no smudges. The colours are vibrant and go on smoothly. Above are a few of the styles we tried out. My boys wanted to be cats like their stripey cat called Yoshi. They don’t sit still for long so I gave it a try. We also had fun drawing Gaston the ladybird from Ben and Holly, Phileppe from Handy Manny and I wanted a pretty pink butterly. We got both sets of colours sent through and there was every colour I was looking for and some. When it came to bedtime and removing the paint, other than a few “I want to keep it on cries” we had no problem at all getting the paint off. It came off and my 4 yo who has very sensitive skin was absolutely fine. I cannot recommend these FacePaints enough. What are you waiting for go to The Little Green Paint Box and order. Have some fun with face paints, you’ll enjoy it I promise. I was sent the Lyra Facepaints from The Little Green Paint Box in exchange for an honest review. Awesome – I have been looking for some good facepaints. Literally impossible to find in Switzerland…You should post an Amazon link, I think.